The Hunt is over for my perfect bag! Last Wednesday was my 6 month anniversary of blogging and I woke up to the best present ever. I few weeks ago, I entered a competition on Instagram. 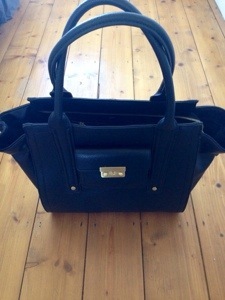 The prize was to win a Philip Lim for Target Tote thanks to The Hunt. You may remember, I wrote about The Hunt a couple of months ago. To put it simply, The Hunt is a website that allows you to post outfits or items that you cannot source on The Hunt site, and then other users of the site notify you if they know where you can get that outfit or item or something similar. So basically its genius! Think of all the times you were on Instagram or Pinterest and saw a dress or shoes that you loved, but that had no information as to where to buy them. The Hunt solves this problem. I would recommend using The Hunt to anyone who has spent hours trawling the internet for that amazing but apparently non existent pair of jeans. Anyway, back to the competition. The idea was to post an outfit on Instagram with a series of different hashtags and then the winner would be chosen. 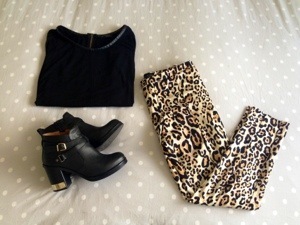 The outfit I posted, see below, was featured in another post ‘I’ve Got the Eye of A… Leopard‘. Silly title I know and I then spent the rest of the day humming The Eye of The Tiger. Anyway (I’m always going off on tangents), I was contacted and told that I won! To say I was super excited is an understatement. So the bag arrived on Wednesday, its like The Hunt knew it was my 6 month anniversary, and since then I’ve been trying on my entire wardrobe to see what the bag goes with. Here’s a hint; it goes with everything! Today I paired it with a green dress from Topshop, my black boots and some Marc Jacobs jewellery. The bag is perfect, all the little details are amazing. As you can see its a pretty huge bag. My sisters have started calling me Mary Katie because they say I’m trying to look like the Olsen’s with the big bag! Its been perfect for college and shopping trips and I can see myself using this bag all the time. Here’s a shot of the Marc Jacobs jewellery I wore. 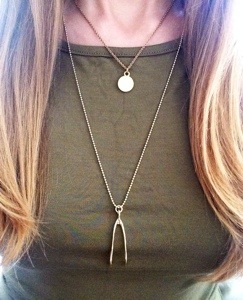 The longer necklace is a wishbone I got on sale in Vegas. The shorter one is a little cream disc, sorry the quality of the photo is poor! Thank you so much to the team at The Hunt! It was a great competition and I definitely recommend checking out their website and app. Ah! it’s gorgeous. congrats on the fab win…..ok, so. at first, I read the post preview in wordpress and went to immediately show my husband that it was your 6 month blogiversary and you got a philip lim….and was already coming up with what that would mean for my 1 year blogiversary…but alas! Aw no! Sorry to disappoint! You should definitely still encourage a treat though, a one year blogiversary a big deal after all! I agree..the plan is still on! Yay! Let me know what you end up getting, I have a feeling I’m going to be jealous!